(Editor’s Note: A few months ago I shared with you what I thought was one of the best reviews I’ve read of American’s new 777-300ER. It was written by AA Geek Chris (@kingdomchris71) and posted on FlyerTalk. 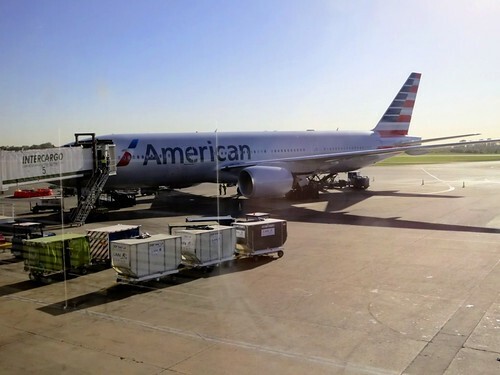 Chris recently returned from a trip to Argentina and had a chance to experience American’s 777-200 Business Class product which has been updated with refreshed meal choices and cabin service. The 777-300ER gets all the attention but I thought you might enjoy a look at American’s current 777-200 offering. 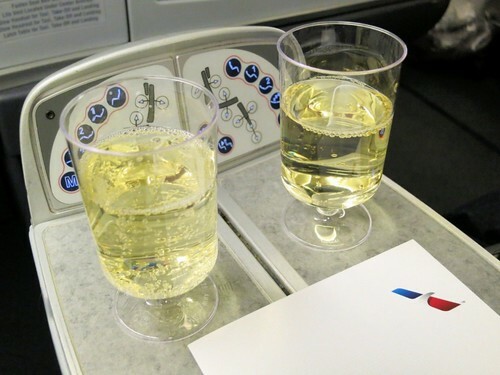 On December 3, we flew AA909 from Miami to Buenos Aires in Business Class. We booked the flight about 2 months ago, into coach, and requested an upgrade to Business using miles. (25,000 miles and a $350 co-pay, one way). About 2 weeks before departure, the upgrade cleared and we were able to go online to select new seats. 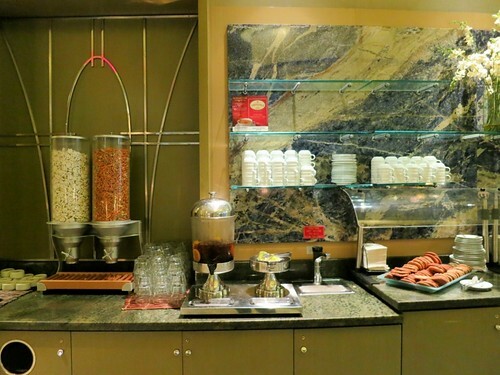 Since it was within 30 days of travel, we were also able to pre-select our dining choices, which is a great feature as you no longer have to be concerned about your first choice not being available on the flight, based upon the typical FEBO procedure. 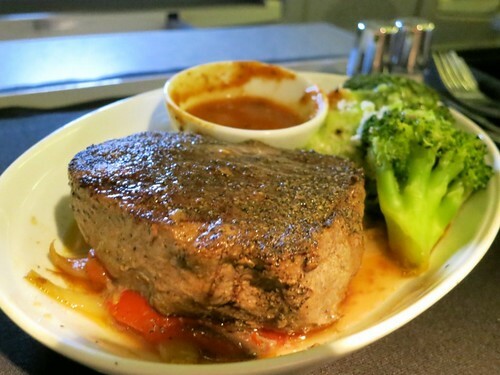 For my main course, I chose the “Grilled Fillet of Beef, served with tomato chile sauce, roasted onions and broccoli polano gratin.” While I realize it may not logistically be possible, I do wish there was a way to select your sides separately, rather than a package deal. Blame it upon me being a picky eater, but I really would have liked the parslied potatoes from the halibut dish with my beef. Not a big broccoli fan. 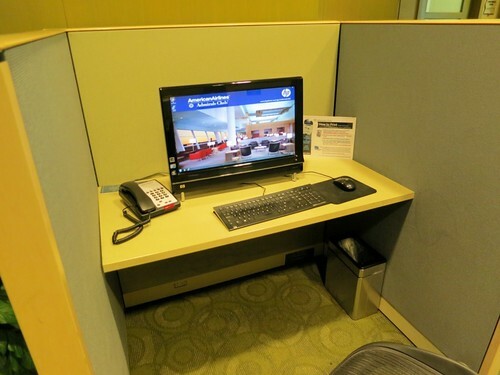 Usually you can check-in online at aa.com 24 hours before your flights. 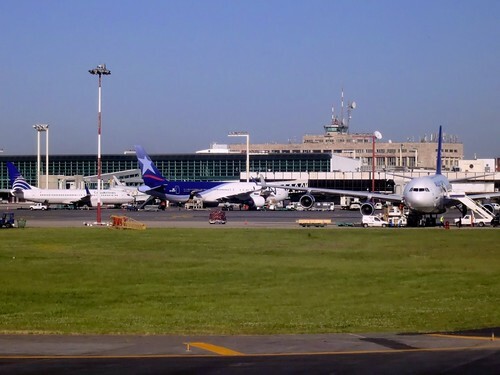 However, entry into Argentina requires US citizens to be in possession of a “reprocity visa” which must be verified before checking in (and usually again at the gate, prior to boarding). For this reason, online check-in is disabled, although you can check-in online for the return flight 24hrs before departure. It would be nice if there was an option on aa.com where you could check a box to confirm you have the required visa and assume all responsibility etc, in order to be able to check-in online. It’s not a big deal since we have to see an airport agent anyway to check our bags, but in the case of operational upgrades which are usually based upon status and then time of check-in, it’s a good idea to be checked in as soon as possible once check-in opens. 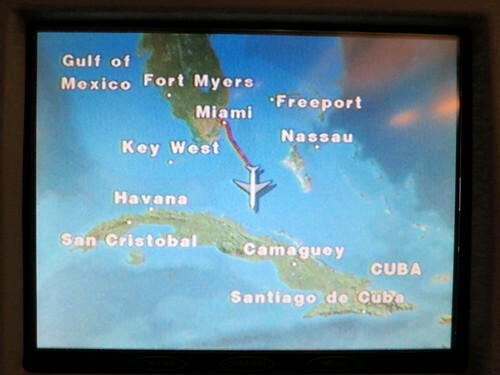 We arrived at MIA approximately 2 hours prior to departure, using the dedicated check-in area for Business Class. 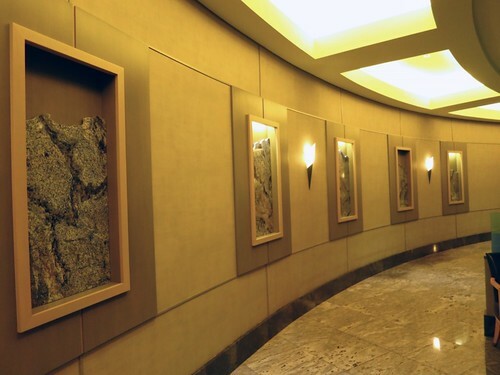 There is also a glass-walled Flagship Check-In area for international First Class. 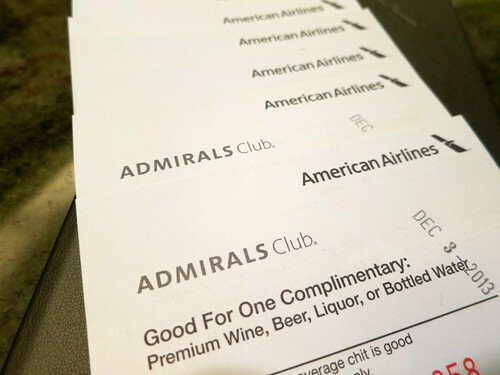 Our boarding passes were printed with our TSA Pre-Check status which allows us to clear security via a separate lane in which we can keep shoes and belts on, and not need to remove liquids or laptops from our bags. All together, from the time we entered the terminal, we completed check-in and security and were airside in less than 10 minutes. 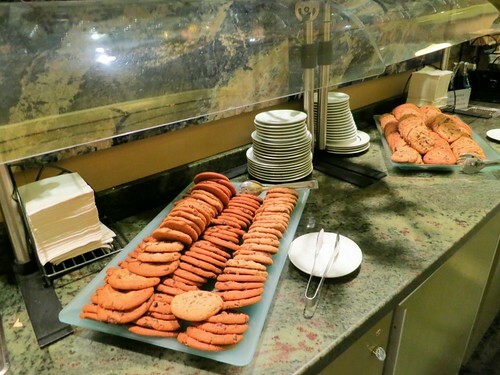 With some time to spare prior to boarding, we headed to one of the two Admirals Clubs. 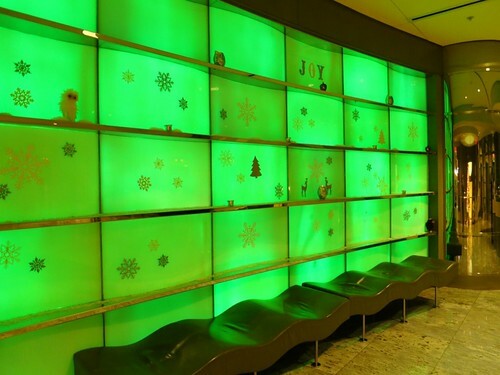 I’ve heard that 2014 may see the opening of a Flagship lounge, as well as a new lounge for British Airways to coincide with their move to the D terminal and introduction of their A380 to the MIA/LHR route. We chose the larger of the two lounges, across from gate D30. 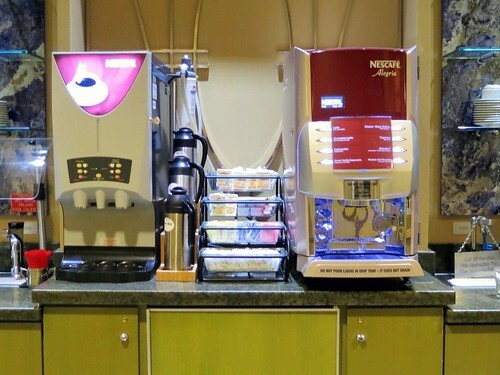 Although it was quite busy, at over 30,000 square feet, there are plenty of places to sit and relax, including a music lounge, bar, cafe and quiet zones where cell phone use is not permitted. 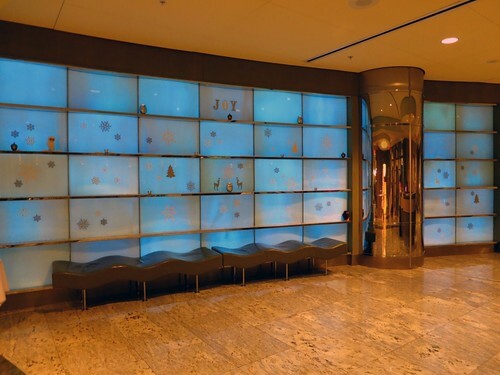 The lounge also features showers, a conference room, business center and kids area with TVs and computers. 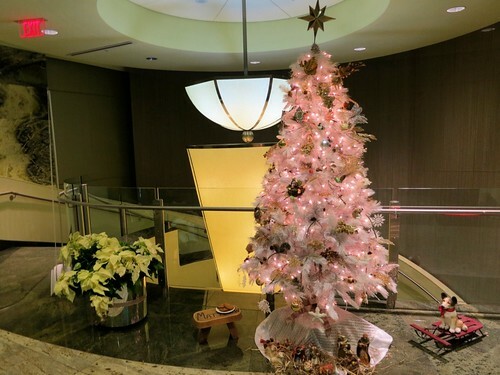 The lounge was nicely decorated for the holidays and we enjoyed the complimentary cookies and yogurt covered pretzels. Alcoholic drinks were available either for purchase or with the coupons given upon arrival – otherwise hot and soft drinks were free. About an hour before departure we headed down to our gate which was quite congested by that time. Once boarding commenced the pre-boards were accommodated, followed by First and Business Class passengers. Agents were checking again the reprocity visas for US citizens, presumably to avoid any potential problems upon arrival in Argentina. On our previous trip to Buenos Aires in October, CBP agents were positioned in the jetbridge, questioning every passenger prior to boarding. This was not the case this time though and we were quickly greeted on board and settled into 11A and 11B. 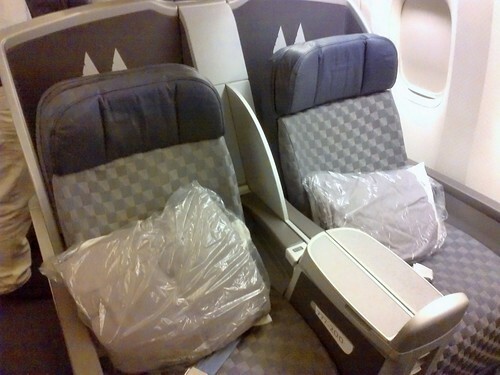 At each seat, we found a menu, comforter, pillow, slippers, amenity kit, bottle of water and Bose headphones. In the past, headphones were distributed to each seat by the crew, this is the first time I have found them unwrapped and at the seat upon boarding. The aircraft was a Boeing 777-200, which does not yet feature the outstanding new Business cabin. I believe the refits for the 777-200 are due to begin next year, at which time the First Class cabins will be eliminated and the expanded new Business cabin introduced. 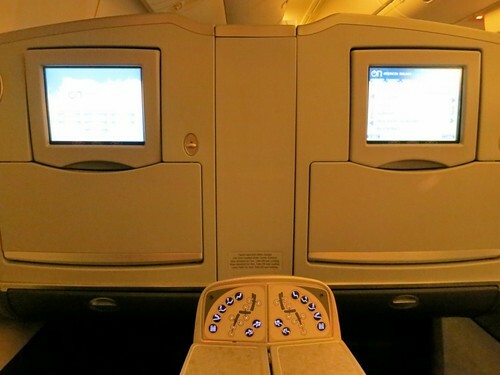 So for our flight, we had the ‘classic’ business class cabin, with the angled-flat seats. 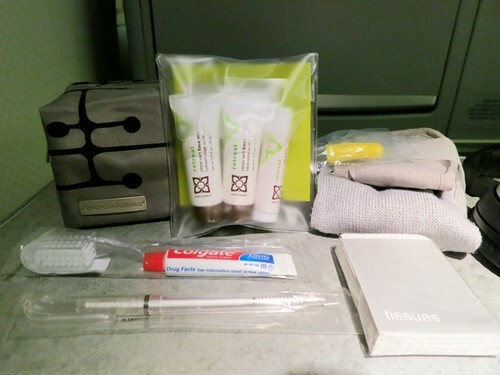 Although the hard product may have been old, the new soft products have been rolled out across the entire fleet, including the new amenity kits and meal service items, which you will see illustrated in the photos. The flight attendant working our side of the cabin was Linda, who is hands down one of the best flight attendants out there. I’ve met Linda before on several previous flights to Buenos Aires. She is the ultimate professional, her service is impeccable, polished and efficient. 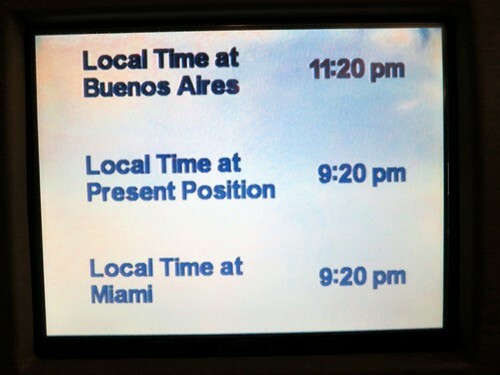 Of the two night-time flights from MIA to EZE, one is served by a Miami based crew and the other by a Buenos Aires crew. 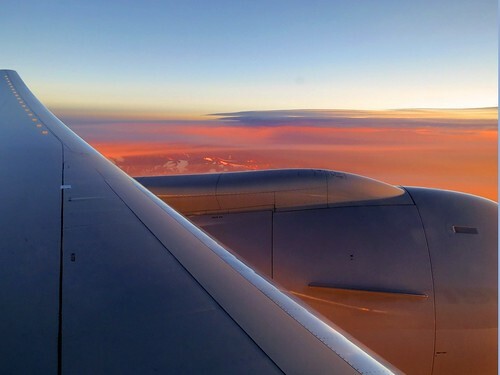 I fly to Buenos Aires about 6-7 times per year on this route, and have always been disappointed with the BA crew that seem almost robotic, rarely smile, or make any effort to go above providing a minimum level of indifferent service. On the other hand, the Miami based crew have always been great, and if you’re lucky enough to have Linda, Trice or Albert working your flight, you’re going to be well taken care of. For me, it’s so nice to board a flight and see a familiar face, especially one of these crew members. 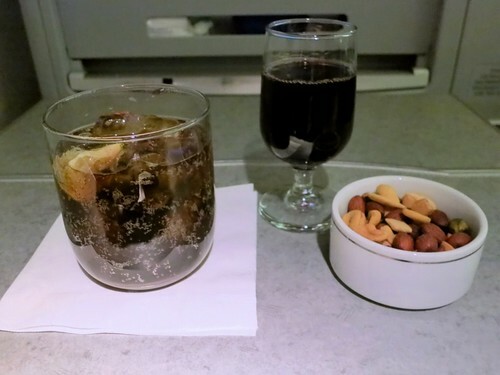 Prior to take off, Linda came around the cabin, providing drinks (water, or champagne) and introduced herself by name to each passenger. Dining choices were taken (or confirmed if previously selected) for the evening meal as well as breakfast, and we were asked if we wanted to be woken or left to sleep. 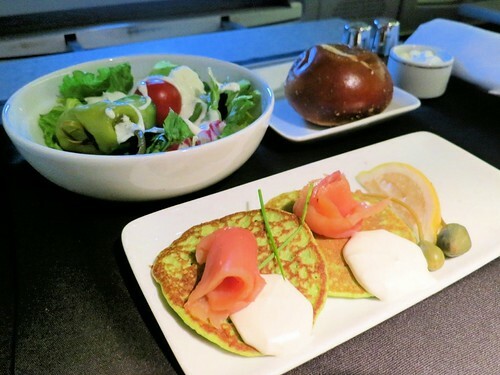 – Smoked salmon with spring pea blinis and cream cheese. – Seasonal greens with fresh vegetables, feta and pepperoncini. 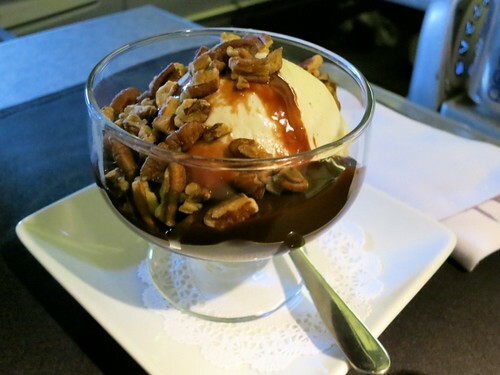 – Traditional ice cream sundae, vanilla ice cream with your choice of hot fudge, butterscotch or seasonal berry toppings, whipped cream and pecans. We departed on time, with a spectacular take-off over downtown Miami and the beaches, before turning south. Shortly afterwards, Linda came through the cabin with hot towels for everyone, followed by drinks and ramekins of warmed nuts. Once those were finished and cleared away, our tables were set up for dinner, beginning with the starter, salad and bread. My choice for entree, the grilled fillet of beef was excellent, cooked perfectly and seasoned just right. As I mentioned before, I do wish I could have had the potatoes with it, rather than broccoli. My companion had the pasta, which he also said was very good. For drinks, he chose the Shiraz, and I had the Malbec. I have to confess, I usually eat my entree too quickly, because I’m thinking about the ice cream sundae that is to follow and want to make sure they don’t run out. I chose to have the vanilla ice cream with hot fudge and pecans – my companion had the berries. The portion size was very generous and nicely presented. Shortly afterwards the tables were cleared, the lights lowered and we settled down to sleep. 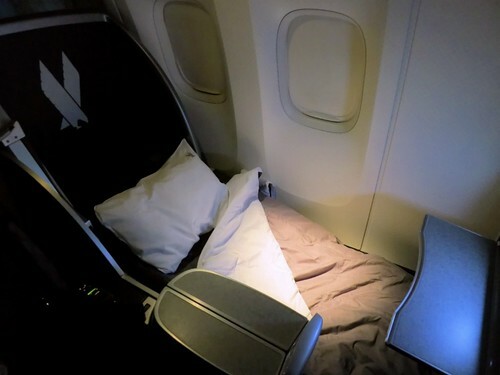 The angled-flat “ski-slope” seats are clearly not as good as the true lie-flat seats that feature in the updated cabin, but still comfortable enough for me to get a good night’s sleep and nothing that an Ambien can’t take care of. I just have to remember to put down the foot rest, otherwise I tend to slide down the seat. 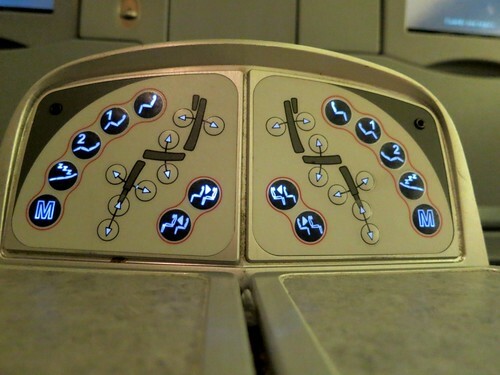 Holding the “Zzz” button will lower the seat into the sleeping position. Once there if you release and press the button again, it makes a slight further adjustment, so you can choose which you find more comfortable. The amenity kit also includes an eye mask and ear plugs, or you can use the Bose headphones to further reduce the cabin/engine noise. Regarding the bedding, the duvet is very comfortable. I like the fact that you have individually controlled air vents, unlike some other airlines, so you rarely have a problem with the cabin temperature being uncomfortable. The pillow is ok, but a bit on the flimsy side – it would be nice if they could be filled with a better quality material. In terms of the color scheme, I find the cabin interiors to be a bit drab. 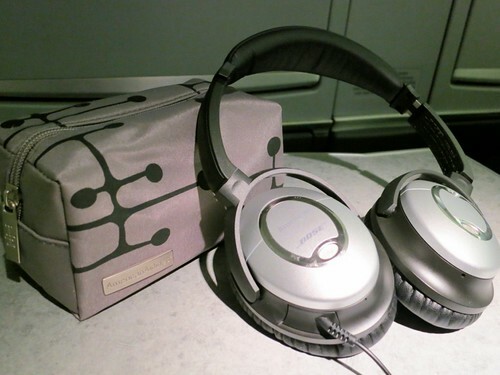 You have gray seats, gray tray tables, gray tablecloths, gray duvets, gray amenity kits, gray headphones, etc. I would really like to see more use of color in the cabins. The new AA livery on the exterior of the plane is so fresh, bright and bold (Oz), but then the interior feels rather dull and bleak (Kansas). The mood lighting in the new 777-300s is a great improvement, but I feel more could be done to incorporate color into both the soft product and the hard product when the 777-200 refits begin next year. I probably slept for around 6 hours which was good, and woke to the smell of brewing coffee. 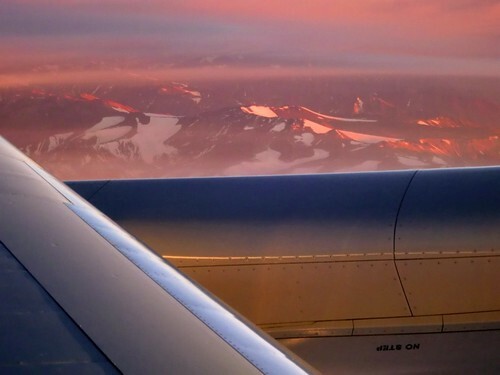 It was just getting light outside, and I peeked out the corner of the window while trying not to flood the cabin with light, and saw the beautiful sight of the sun rise and the snow capped Andes. 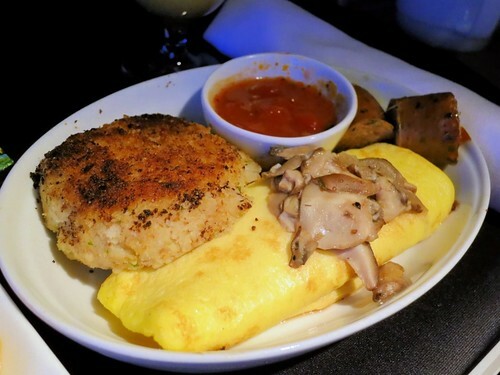 – Three cheese omelette with pomodoro sauce, basil sundried tomato turkey sausage and potato croquette. 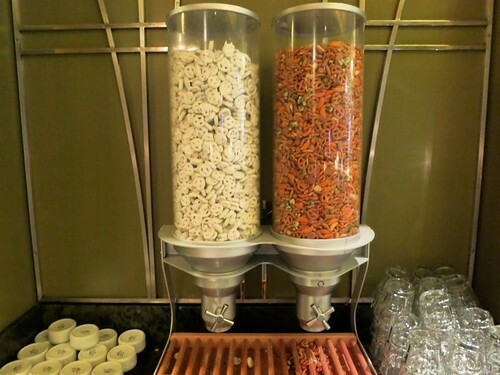 – Continental breakfast, granola with yogurt. 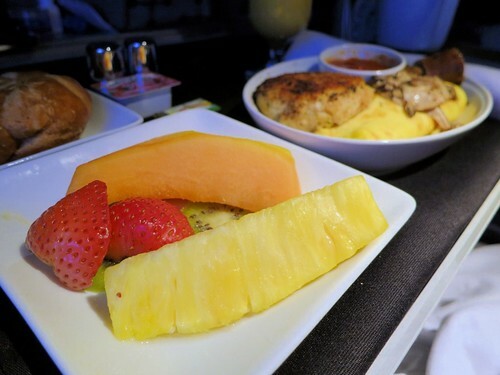 Both options were served with a side plate of fruit and a croissant. I chose the omelette which was very good. After a quick trip to the bathroom to freshen up, I returned to my seat and placed it into the recliner position for the remainder of the flight, which is very comfortable. 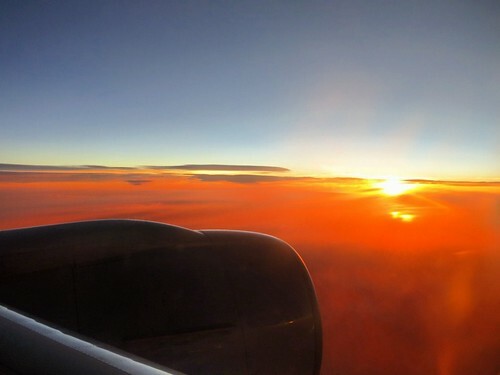 Soon afterwards, the pilot announced to prepare for arrival, and it was time for seats up and tray tables away. Linda came through the cabin one last time to pick up any remaining service items and to thank each passenger for flying with American. We landed a couple of minutes ahead of schedule and disembarked through the door in front of the first class cabin. As we exited the jet bridge, I noticed our plane featured the updated AA livery which looked great against the bright blue morning sky. In summary, this was a great flight. Although it was the old business cabin, the service we received was truly first class, and we arrived rested and ready for the day ahead. I look forward to experiencing the new business cabin next year, if not on a Buenos Aires flight then on a London flight booked for early in the year. 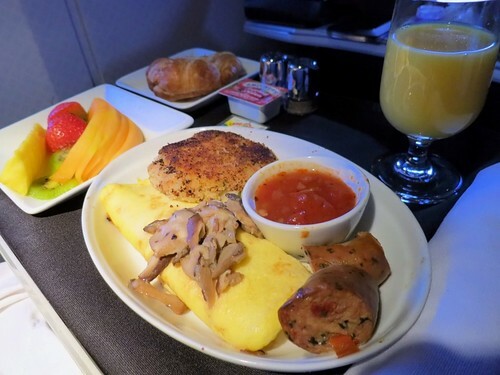 I’ve previously flown the new 777-300 in First Class (which you can read about here), and it’s an amazing aircraft including lots of new features such as international wi-fi, a cappucino/espresso machine and a snack bar for business passengers. Thanks for reading! Great post. We are flying out of Dallas to BA in a few weeks and anxiously awaiting news of our upgrade. After reading your post, will be very disappointed if it doesn’t go through. Menu options look wonderful but I hope the online menu allows for allergy requests (I’m allergic to dairy). Thanks for all the great info! @ Joanne – Thanks for your comment:). Hope the upgrade clears and that you have an awesome trip!